Spectrum, a comprehensive Retail Business Management Suite solely built for Retail. From simplicity at the Point of Sale (POS) to the complexity of a complete company overview with the mere click of a mouse - Spectrum is the future of retail, delivering the retail experience of tomorrow, without the wait. A Unified, Multi-Channel, Multi-Modal, Agile and Comprehensive Next-Generation Retail Business Management suite. Spectrum is an innovative, leading edge solution that addresses the typical challenges faced by Retailers through a feature-rich, scalable, robust and reliable solution. Full Spectrum capabilities fortified by IBM technologies. A best of breed solution as a certified part of IBM's Retail Industry Framework. Spectrum Enterprise - Blue Edition is ready for IBM DB2 and IBM Retail Integration Framework certified. 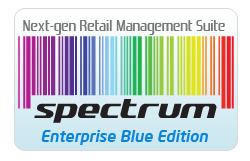 Spectrum Enterprise - Blue Edition resides on top of the IBM Websphere® Remote Server (WRS) to make this solution available to retailers at an acceptable price-point. The underlying DB2 database makes it capable of handling large volumes of data while Websphere® MQ is leveraged for that much needed reliable data synchronization across the enterprise. The Websphere® Application Server within WRS provides the base platform for all the server-side architectural artefacts to operate in an orchestrated fashion. The Spectrum Enterprise – Blue POS system has been tried and tested on IBM SurePos 700 Series systems with a local DB2 Express database which has a low memory footprint thus keeping the POS till highly performant at all times. CITI (IND) and IBM combine extensive retail experience with expertise in business management, hardware, software and services. Together, the partnership delivers capability that enable retailers to address their challenges and achieve profitable growth. Spectrum resides on top of the IBM WebSphere® Remote Server (WRS), a leading Service Oriented Architecture (SOA) that delivers a fully integrated platform to manage remote environments. This helps make Spectrum available to retailers at an attractive price having integration capabilities with existing systems. Due to the process-oriented nature of the business, the solution incorporates a Business Process Management Engine providing ease of configuration. Additionally, the n-tier, replicated layer and reliable synchronization engine not only allows for multi-level data consolidation, but also provides disaster recovery features at an application as well as data level. The Business Analytics layer comes preconfigured with standard retail analytics and has the possibility to integrate with any enterprise data warehouse. Device independence is brought in via implementation of the UPOS interface standard, which makes the POS interoperable with a wide variety of peripherals. The creators of Spectrum, CITI (IND), and IBM, combine extensive retail experience with expertise in business management, hardware, software and services. Together, the partnership delivers capability that enable retailers to address their challenges and achieve profitable growth. Retail empathy – Spectrum developers have retail experience. They understand the pain points and ambitions of retailers across formats and merchandise categories. IBM validation – Retail industry Framework, open-standards-based platform for retail solutions for ease of implementation and integration. Support services – Support is provided during and after implementation by staff with the experience of managing technology in some of the largest organizations in the world. Comprehensive support – IBM has more than 4,400 consultants dedicated to the distribution sector, with more than 750 consultants worldwide specifically focused on the retail industry. Global experience and reputation – IBM has nearly 2,000 retail business partners – the largest business partner network in the industry. Retail-specific hardware – IBM’s time-tested, trusted and robust PoS devices, servers, printers and peripherals are designed for the retail sector. SPECTRUM creates a unified shopping experience that increases customer conversion, drives higher margins, and facilitates faster business growth. Its adaptability and flexibility allows retailers immediate modifications in an ever-changing industry. Minimized investments in user training supported by intuitive GUI & Unified Product experience. Business intelligence engine for dynamic business decisions and strategizing. Centrally managed pricing and promotions engine with seamless integration at Point of Sale and store level flexibility. Easily and quickly execute sales and marketing strategies. Enrich customer experience with dual display & POS based advertising thus driving higher sales. Spectrum is designed to handle multi-layered business hierarchy, variety of business models and several retail formats. It supports franchisee models spread across multiple geographies through its robust technology architecture and a variety of features and functionalities which are available out of the box. Get started quickly, Easy to setup and simple to use Pictorial user interface. Our focus is on customer support.Many ways to reach us with no additional charges. Simple, one time affordable pricing for small and large businesses. No hidden costs. Frequent software updates with latest features. Free of cost. Remain up to date.